Generation Beauty Toronto was not on my list of things to do over the weekend, until last minute. I was told by a pr company I've been in contact with for the past week or so, that I would have the opportunity to go. I did face a couple obstacles with registration, but lucky for me, I got in!! 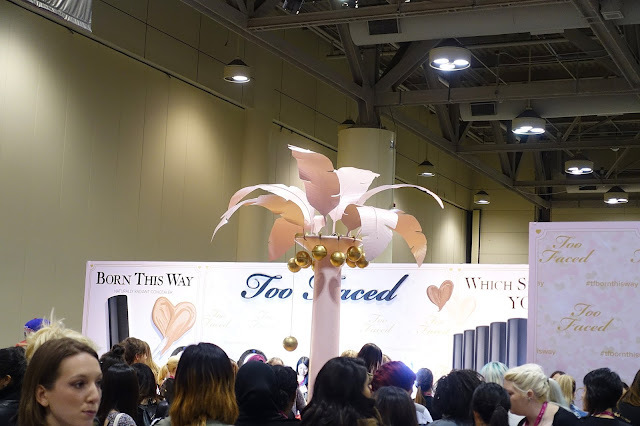 Today I'll be sharing with you my experience with the first ever GenBeauty Toronto! FYI, This is going to be a picture heavy post! If you don't know what Generation Beauty is, let me fill you in. Generation Beauty is a huge beauty event presented by Ipsy, the glam bag subscription created by Michelle Phan one of the OG's of YouTube. It's fairly popular amongst beauty lovers and creators in LA and has now expanded to New York as well. I'm forever grateful for being given the chance to attend the first overseas Generation Beauty, right in my own city of Toronto. It's a great place to make new friends, meet creators, lovers of make-up, and basically get new make-up too. I personally was willing to purchase a ticket for the event, when it was $100. The pioneer rate was about $60 or so, which was amazing, but sold out before I knew about it. When I was ready to purchase the $100 ticket price, those were sold out, and tickets were going for $200. I felt that was too steep for my pockets, so I had no intentions of going. I will be sharing you my experience, and also what I got from the event, to maybe help justify if it's worth going to or not. The previous night, I went to the gym pretty late, so I was pretty much exhausted the whole day. The event was from 11AM-5PM on Saturday, and I arrived at the Metro Toronto Convention Centre at 10AM. Already, there was one long line, and I got a spot in the second wave/line. The lines were ridiculous, who knew that many people were there! 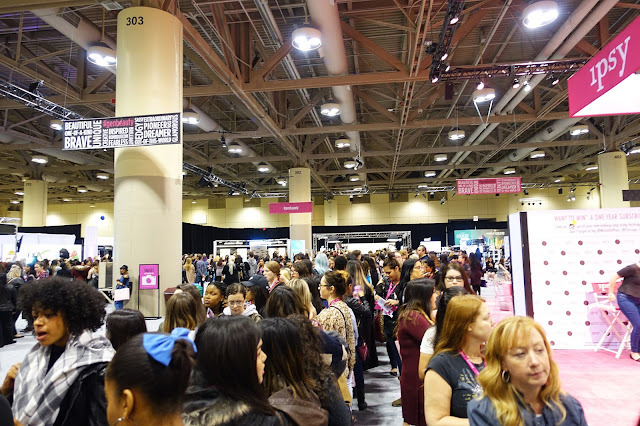 If you want to get the best products, or get to your favourite booth first, I suggest leaving bright and early, and trying to be one of the first people in line. Upon registration, you receive your pass that also has a booklet of coupons. These tickets allow one free item from each exhibitor booth, which allows every single attendee to receive a product from each booth. Pretty genius idea I must say, so everyone gets a fair chance at the free stuff. I had a picture of it on my Snapchat, and I totally wish I saved it! It was essentially a map of the layout of the event, with perforated tickets of the brand name all around the map. You rip the ticket off and give it to the brand booth in exchange for your free product. 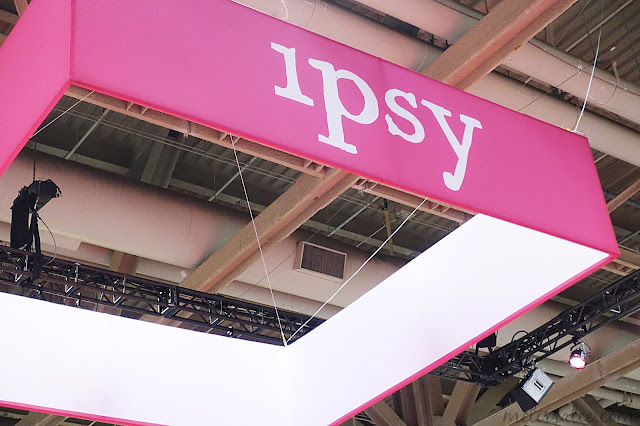 At the Ipsy booth, when you redeemed your ticket, you got to choose 1 of 4 super cute canvas bags. 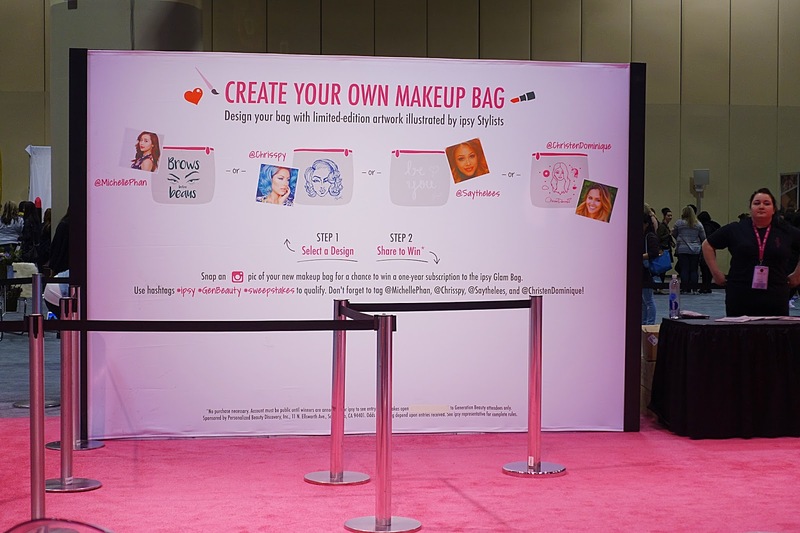 Each bag had a limited edition artwork illustrated by ipsy stylists! They even had the print screening machines there, showing how they bags were made! I of course chose Michelle Phan's design. Super cute! 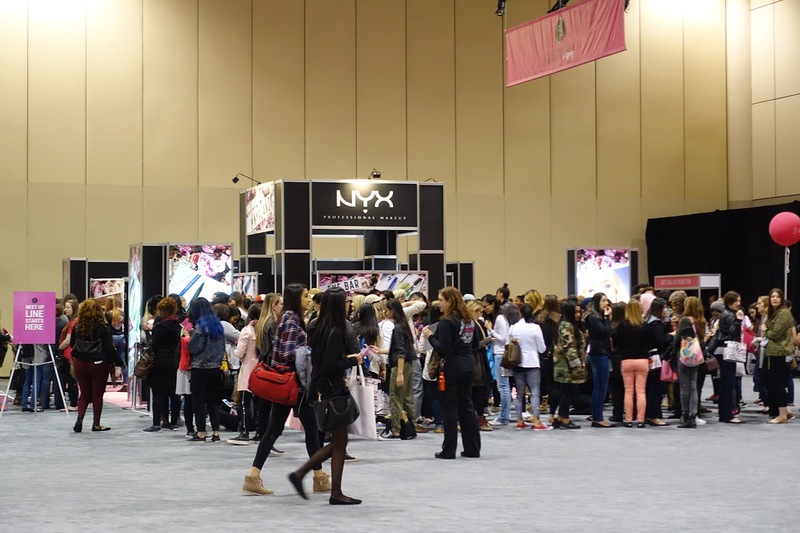 The NYX booth was constantly packed, they were one of the booth's I didn't bother going to. I decided to head to Make Up For Ever first, because I heard in the past that they gave out a full sized foundation! It definitely wasn't a full sized foundation for me, but they did have the best free items, which I'll share below when I get to the haul. I made my way around to most of the booths, except for a few where the lines were ridiculously long. I decided to save them for day 2. Here is my Day 1 haul, along with product names, full prices for full sized products, and estimates for the deluxe and sample sizes. 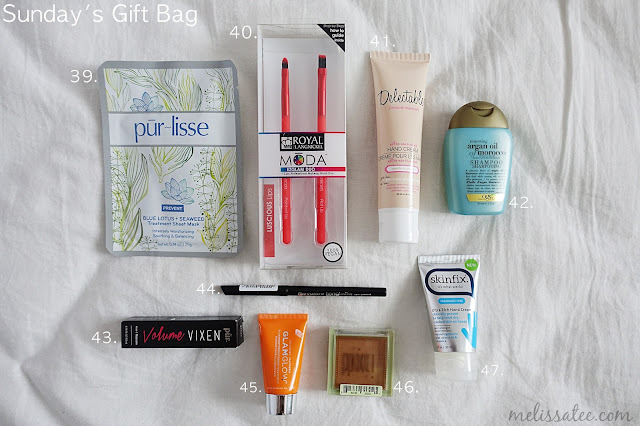 I took photos of specific brands separately, that I found to have the best freebies. 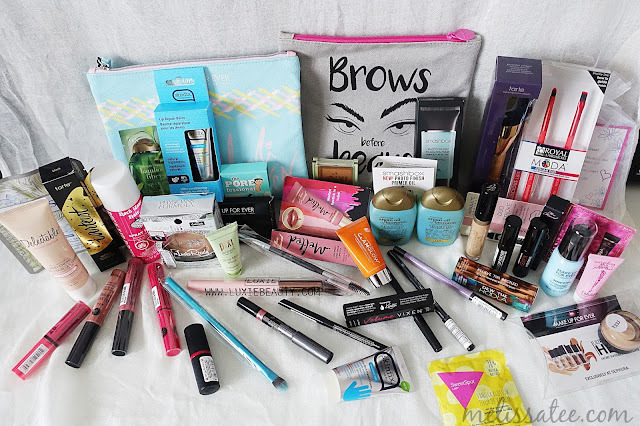 I will also be putting stars besides products I will be reviewing, and if theres anything you want me to review that I haven't starred, just let me know in the comments below! Enjoy! Out of all the exhibitors, Make Up Forever gave the best stuff. A lot of variety and the highest value (if I did my calculations right!). 1. 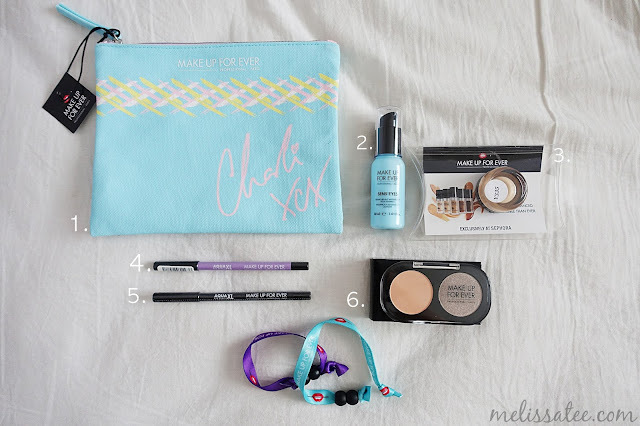 Make Up Forever Charlie XCX bag - $? 14. 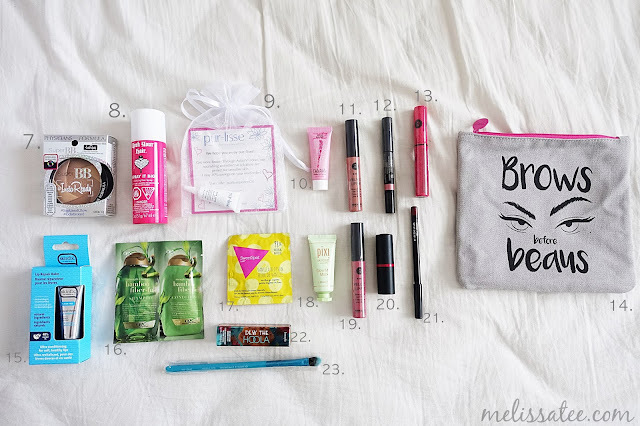 Ipsy Canvas Make-up Bag - $? Tarte was selling their products for a discounted price. I had high hopes they would be giving out their lip paints as the freebie, but I have yet to try this mascara so this is just as good! Nearing the last few hours of the event day, they announce that you're able to pick up your daily gift bag. 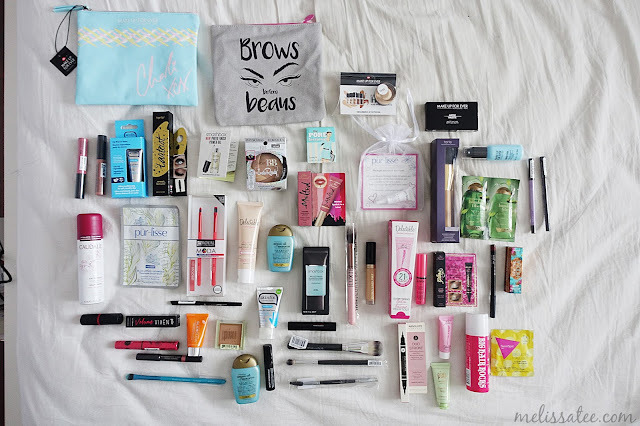 I had high expectations for these bags, seeing as the ones people got in the LA GenBeauty were amazing. It was definitely not what I expected, but the value was still very good. I left the event around 4pm, and decided for my last venture, I would go meet Saaammage. She was super friendly and absolutely gorgeous. Seeing as I visited most of the booths on day 1, I came way later on day 2 since I knew I didn't have much left to do. My first stop was the Too Faced booth, and I honestly wish I came earlier for this one. See those gold coconuts? This was probably the most popular of all the booths because of the chance to win a big prize. I wasn't close enough to know what the prizes were, but you pressed a button, the coconut came down, and you won whatever it said inside the coconut. Because there was only two hours left of the event when I came, they had to shut down the coconut tree since it took too long. 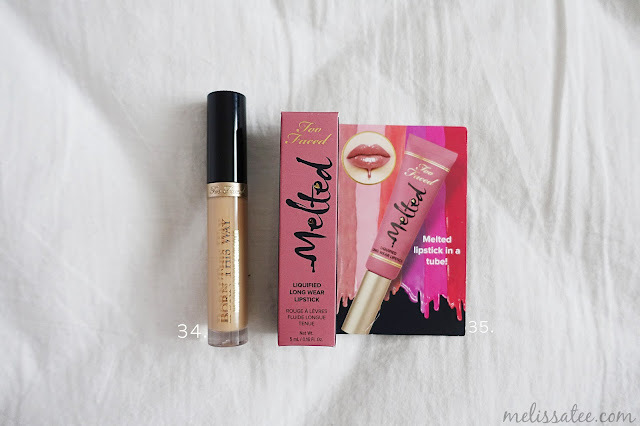 Quite disappointing, but we still got some great goodies from Too Faced. I waited an hour in the line for my freebie. Smashbox had a long line up the first day, but because I went so late and everyone went on Day 1, there was no line up at all. A lot of the booths had interactive social media campaigns. 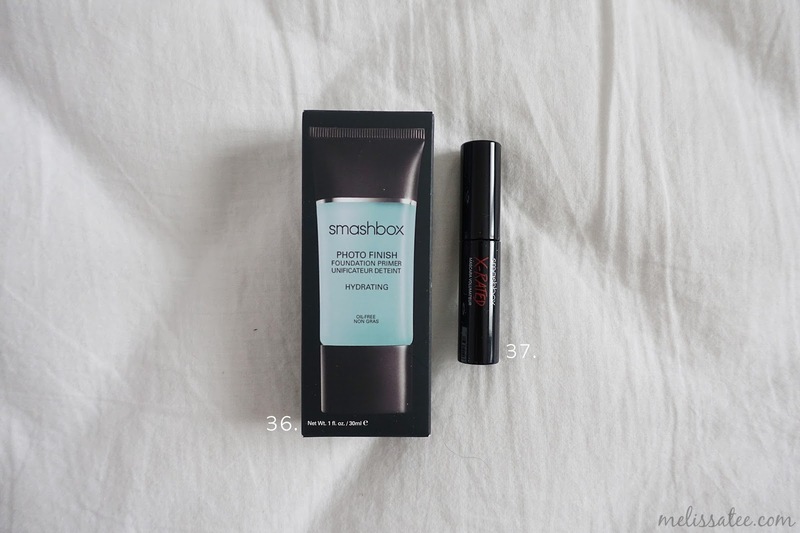 The freebie from Smashbox was a full sized primer (amazing right? 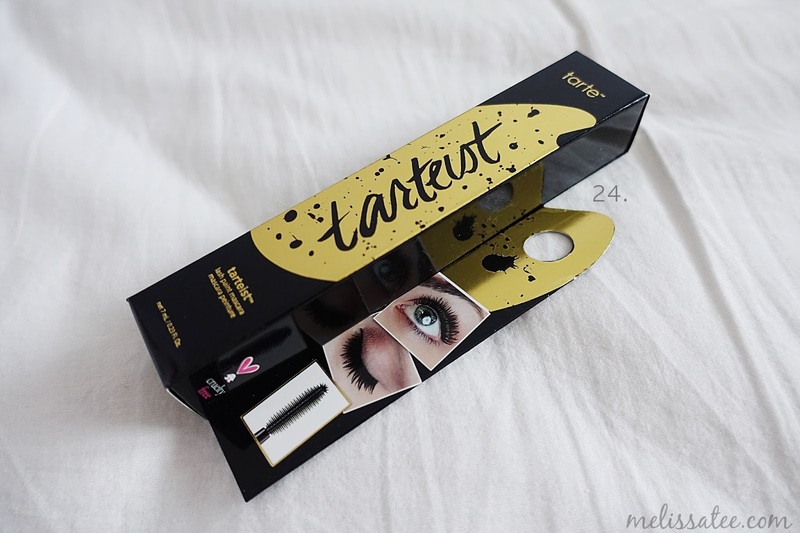 ), and if you liked their Instagram page and showed them you were following, you received the deluxe mascara as well! 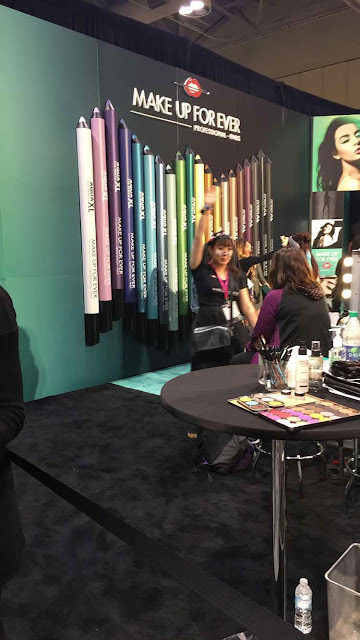 Luxie was another one of the busier booths, because a lot of people wanted to purchase the brushes they were selling. 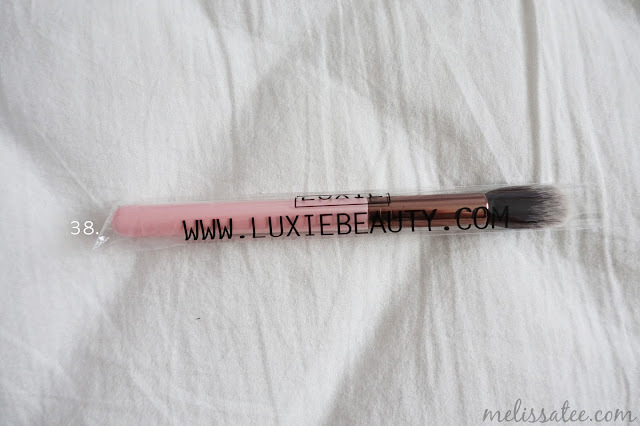 I was happy to see that the freebie was a highlighter brush, and a gorgeous one too. I believe at all the booths except for maybe Too Faced, you were able to purchase some of the products. 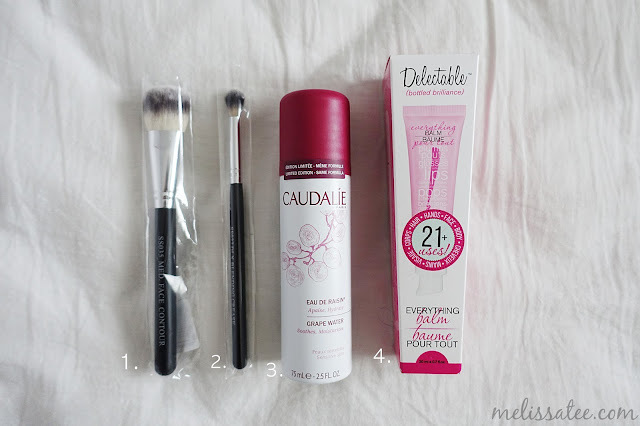 I bought stuff from Crown Brush, Caudalie and Cake Beauty. Grand Total of Goodies from GenBeauty: $615.82! 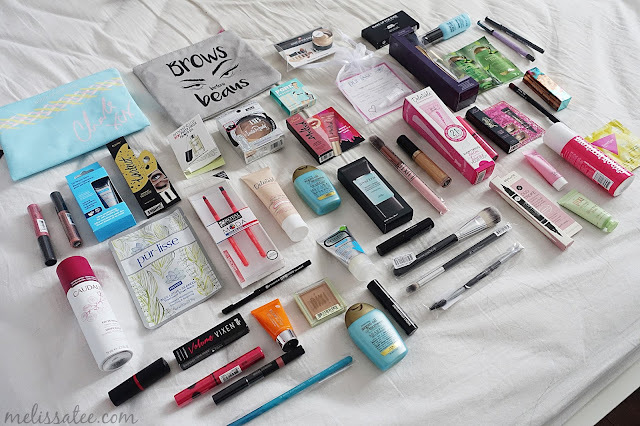 Considering the amount of products I received, if I did pay the large sum of $200, I feel GenBeauty was totally worth it. 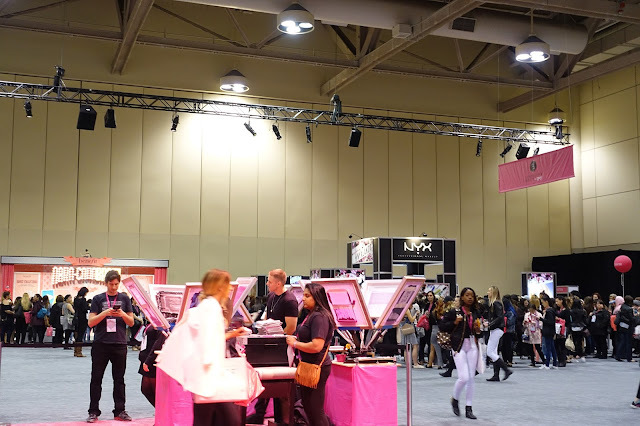 Even though this was the first GenBeauty Toronto, the event went very smoothly, because they were experienced and prepared. If you don't like waiting in lines, then this event isn't for you. It's 90% waiting in lines for free stuff, 5% taking selfies, and 5% everything else. I went by myself and I still had an enjoyable experience. If I brought a friend the next time, it definitely would be a lot more fun. It's a great way to network with other beauty creators, and make friends who have the same interests and passion for beauty. Compared to IMATS, Gen Beauty was a lot less stressful. The first day was stressful because I didn't really know what to expect, but the second day was smooth sailing. The lining up part gets a bit claustrophobic, but in general, the event is very spacious and not that crowded. Would I go again next year? If I do plan on it, I will for sure try and buy the early bird tickets. $200 is a lot to spend on a beauty event, but you do get 3x your money's worth in products. Would you be interested in going to Generation Beauty if it came to your city?